Let’s take it back to 2004. Snoop Dogg’s “Drop it like it’s hot” is burning up the charts. It is also when we hear the music producer, Pharrell Williams, shout out his sneaker brand on the song with the quotable ,”You see these ice cubes, you see these Ice Creams.” Fast forward to now, and we are still seeing the Ice Creams, this time, in a new iteration. 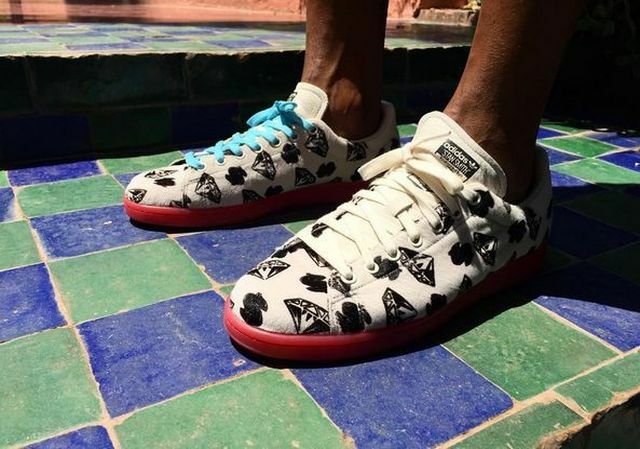 Pharrell’s longtime streetwear brand, Billionaire Boys Club, is linking up with Adidas to produce an Ice Cream inspired Stan Smith sneaker. Pharrell took to Instagram to show off the collab and stunt pretty much on everyone. Back before rappers were getting shoe deals left and right, Pharrell was at the forefront with a deal with Reebok, that produced the Ice Cream skate shoes. The shoes featured the well known, “diamonds and dollars” print all over the shoe. Just a few years back, Pharrell revamped the Ice Cream line and it seems to be doing great, considering that he’s linking the two brands together. There isn’t any word on if these are releasing or not. Either, way Pharrell is looking to keep your attention. Let us know what you think in the comment section.